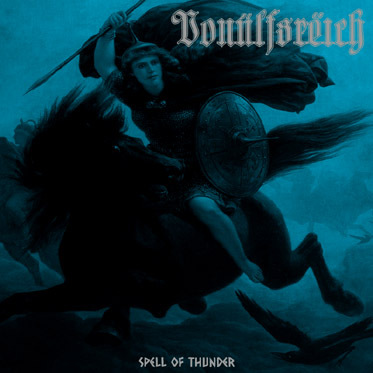 Vonulfsreich are a band from Finland that plays a very raw and old school form of black metal and this is a review of their self titled 2015 ep "Spell Of Thunder". A very dark and slow guitar riff starts off the ep before speeding up and going into more of an old school black metal direction along with some grim screams and the music go for more of a 90's second wave style and the songs also bring in a great mixture of slow, mid paced and fast parts along with the faster sections using a great amount of tremolo picking. All of the musical instruments on the recording have a very powerful sound to them and when solos and leads a re utilized they also remain true to an old school style of black metal and the songs seem to be influenced by both the Nordic and Finnish scenes of the early 90's along with a brief instrumental and the last track is very long and epic in length and also brings in a small amount of thrash elements and death metal growls. Vonulfsreich plays a style of black metal that is very heavily rooted in the early 90's and all of the songs sound like they could of easily been recorded and released during t hat time frame, the production sounds very raw and old school while the lyrics cover Occultism, Mysticism, Misanthropy and Nature themes. In my opinion Vonulfsreich are a very great sounding old school black metal band and if you are a fan of this musical genre, you should check out this ep. RECOMMENDED TRACKS INCLUDE "Barbaric Bloodlust" and "Kaikka Paha". 8 out of 10.